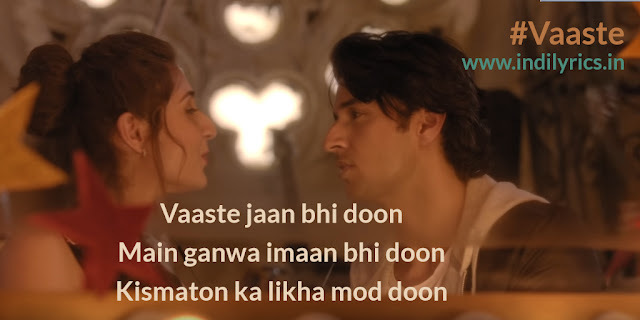 Vaaste Jaan Bhi Doon Full Song Lyrics with English Translation and Real Meaning Explanation from latest single track from T-Series. The delightful love song has been composed by Tanishk Bagchi while Arafat Mehmood penned the lyrics, Dhvani Bhanushali & Nikhil D’Souza sang this song. The music is available under the label of T-Series. The audio mp3 version of Vaaste by Dhvani Bhanushali & Nikhil D’Souza is free to download and stream from Gaana, Hungama Music, Wynk music, JioSaavn and other online music portals. The music video of Vaaste stars Sidharth Gupta, Anuj Saini & Dhvani Bhanushali herself. Where will I go without you? My journey and my whole life…..